As the season dawns, the fruit upon the tree begin to glow a vibrant yellow, ripening from their fuzzy green beginnings. The flesh of the fruit is crisp and feels almost frozen under the knife. Warmth transforms the quince. At first, you don't quite know how to dress a quince. Tights, leggings, boots, butter, poaching, roasting? Once you take the coat off a quince, it must be quickly submerged into a new home without being left out in the damaging air. Once placed in the pan, the creamy flesh slowly changes colour. By the end, chunks of quince are the colour of a crisp autumnal sunset. 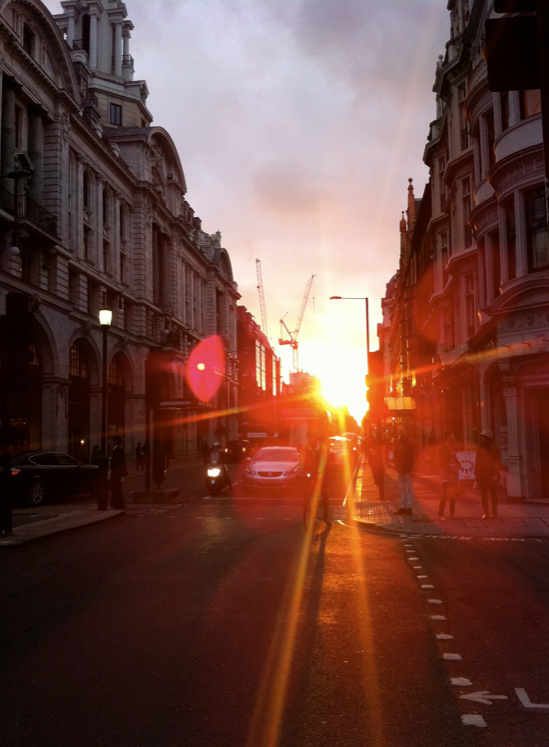 I'm slowly getting used to an urban sunset, a city autumn - litter mixing with the mounds of crisp brown leaves, the tube-heat-coat troubles. I found these quinces at a little market. Having never seen them for sale before, I grabbed a few. My grandmother used to make quince jelly but I didn't have enough. Simplicity won in the end - I wanted to really be able to taste this new fruit. Finally, the rice pudding. As a child, I never really liked rice pudding. I fell in love with it this summer, when I ate a lot of it in France. It was served cold for breakfast, thick and creamy and topped with fresh fruit coulis. This pan barely lasted long enough to be photographed. Sometimes the simple pleasures are the best. I thought it would meld well with the rosy quince. Each mouthful morphs from creamy to fragrant and fruity as you eat. 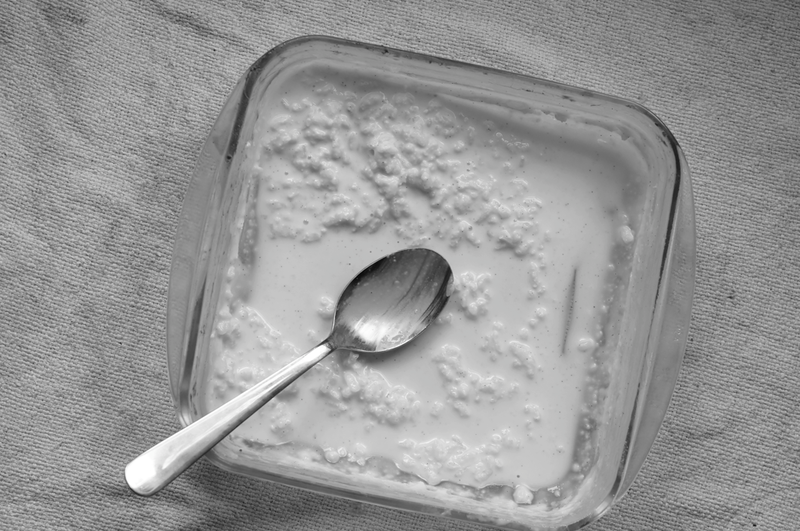 Place the rice, milk, caster sugar and sea salt into a medium saucepan. Split the vanilla pod and scrape the seeds out. Place the seeds and pod into the milk. Set over medium heat and bring to the boil then bring down the heat to a gentle simmer. Keep heating, stirring occasionally and scraping the bottom with a spatula. It will slowly thicken and the rice will cook. This can take at least an hour. (You can cook on the stovetop for 30 minutes then bake in the oven for 30 minutes at 150C too). By the end you still want it to be fairly loose as it will thicken - the rice will be visible on the top and the sauce should be about the thickness of custard. When it's ready pour it into a dish and cool to room temperature. Chill in the fridge overnight, or for at least 2-3 hours. 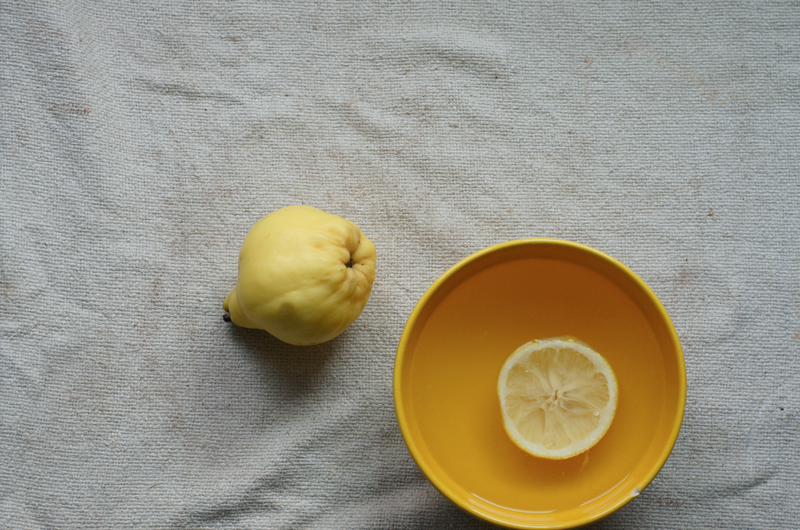 To start the buttered quince, prepare a bowl of cold water with a slice of the lemon, squeezing it to release the juice. Rub a little lemon over your peeler and peel the quice, dipping the exposed areas into the water. Cut into quarters and place three into the water. I found it easiest to then cut these in half lengthways, place on their triangular bottoms and slice the core out. Chop into chunks and place back into the lemon water. Repeat for the other pieces. When they're done, place the butter and sugar into a medium pan and melt together. Juice the rest of the lemon into the pan and stir. Finally drain and add the quince chunks. Stir together and heat over a low-medium heat until the quince is very soft - it should be pinky orange instead of cream and easy to squish. This takes about 45 minutes, depending on the ripeness of the fruit. 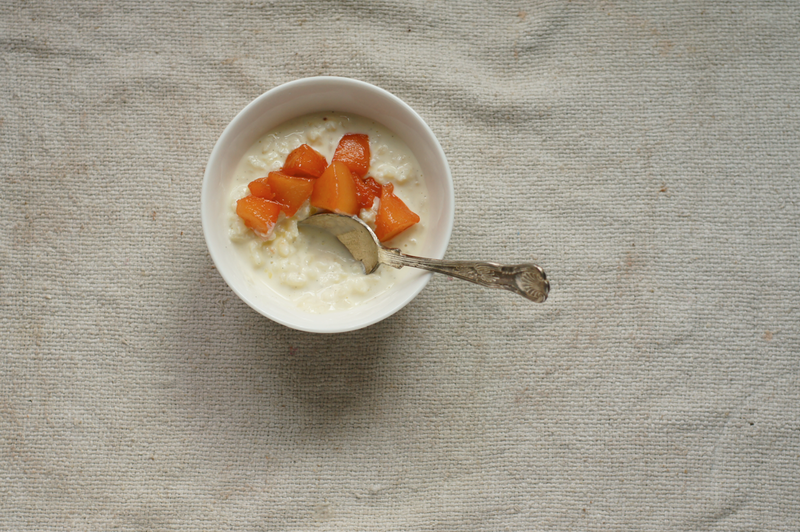 To serve, spoon some of the cold rice pudding into a bowl and then top with some of the buttered fruit. 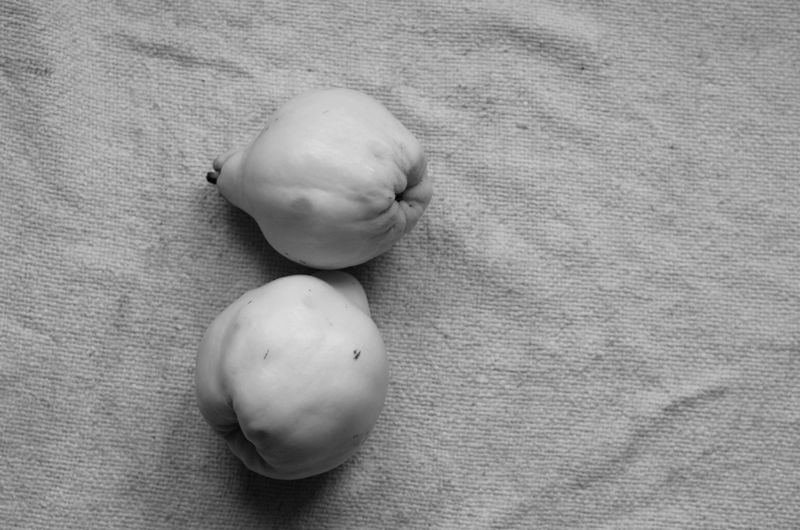 Mmmm quince. I had quince compote on my porridge today. 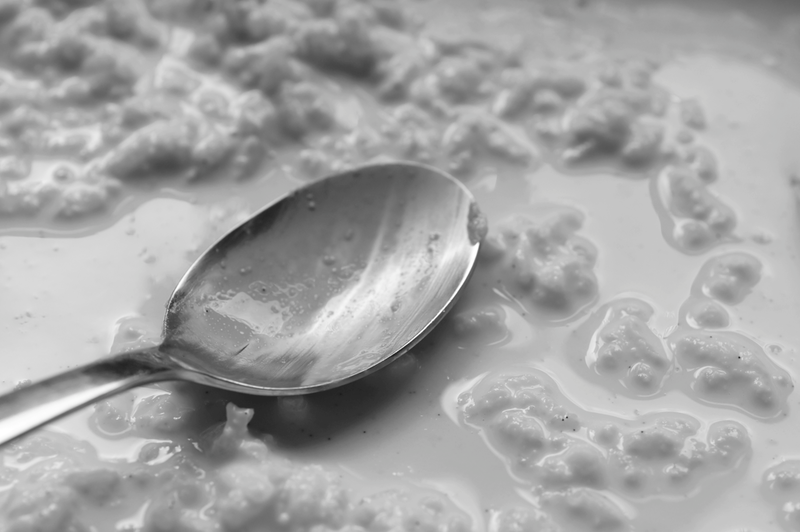 I hate rice pudding though, because the texture reminds me of porridge yet it's all sugary, which just seems wrong in my head as I never sweeten my porridge. Your photos are so beautiful. 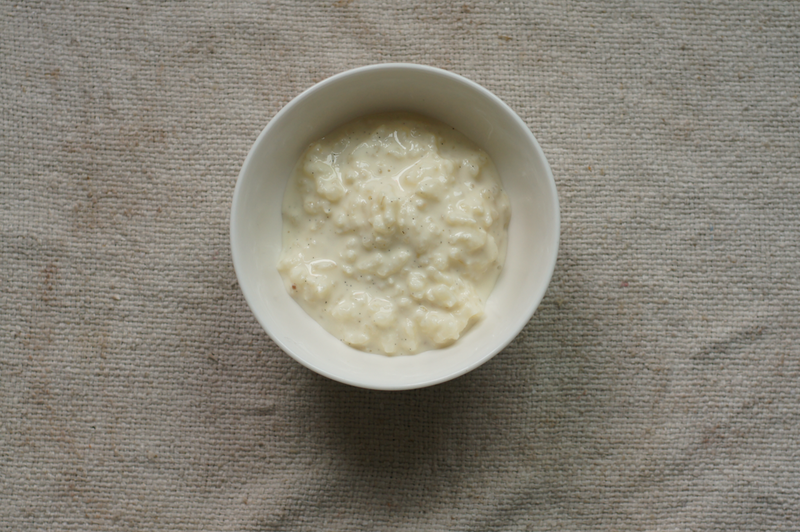 They echo perfectly the comforting, quiet moment that a bowl of rice pudding (or indeed porridge) creates. I am in awe. Oh, and I'm also pretty jealous of the course you are doing! Rice pudding is wonderful. My Granny used to make one every day of the year, apart from Christmas. 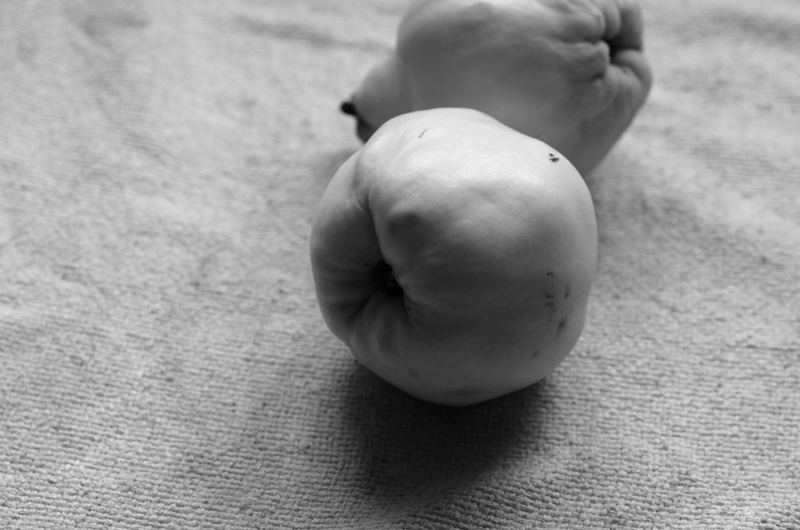 And with quince too - what a treat. Oh I absolutely love quince. I always think it's so magical how it turns that beautiful blush colour. I'll have to try it buttered, it sounds divine! talesofpiglingbland - Thank you! I hoped that they would convey that feeling. Eggs on the Roof - That's amazing - every day! Was it for dessert or breakfast? The quince went really well. Steph - The transformation is so magical! Buttered is great but I can't wait to try it other ways too. oh my gorgeous! i would love a bowl of this in front of my face right now. I have a quince tree in my backyard. It's the one tree that bears a ton of fruit and I never know what to do with it all. I wish I could send some to you! !